If you’re not going to buy a TomTom or Garmin gps unit for your Truck, then the Rand McNally TND 720LM is very much the next best option. I think if we were honest, the Rand is probably as a good a gps unit as the TomTom or Garmin, however what put us off buying it is that we have bought non-branded name trucking gps units in the past and always the outcome is the same – They slowly go wrong and after a year or so are useless. 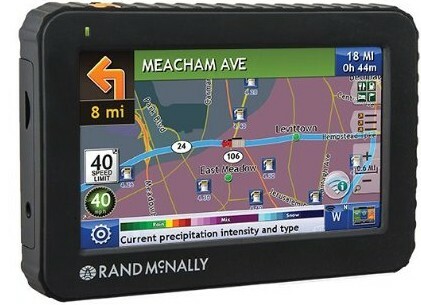 Rand McNally should know how to build great truck gps units given they have been build them for the last 70 years. Their trucking gps devices comes with over 35% more useful features when compared to other trucking specific GPS units on the market today, to help you along your route. The Truck navigator comes with a high resolution 7-Inch screen that is controlled with the on-screen touch screen. The truck gps comes as standard with a super fast processor which means that route calculations are very easy and the you can have a choice of route based on traffic and even driving options. When you’re ready to move, simply enter your trucks measurements into the gps unit meaning that the gps will can only take you down streets and highways where your truck or rv will legally allowed to fit down. After this process, you can use the full keyboard to enter your destination via either the zip code or via the street and number allowing your route to be calculated. Directions are provide both on screen and through turn-by-turn voice directions and whilst the maps are very good and provide a lot of detail that is helpful with your driving, the output does not have the crispness of the top of the range brand names truck gps models. When you approach a difficult junction, the unit automatically switches itself to “Junction Mode” view which provides a 3D display of the approaching junction and bright arrows to show which lane you should be in to ensure that you take the right direction to get to your destination.A few things that we have not seen on Truck Navigators before include the ability to connect your gps unit to the internet using WiFi. This brings a whole host of new features to your unit that can potentially add real value and help you get to your destination on time with the least number of problems along your way. Examples include, current and forecasted weather data to include wind speed along your route, Road Work construction updates and enhanced truck routing options such as Exit Quick View to help find truck-friendly locations along your route. Overall, we really like the Rand McNally and as long as you can accept the fact that it’s likely you’re going to need to buy another truck gps unit in 12 months time then this is a great model for you and comes with a lot of applications that are both very useful and work well. What the McNally does not have in terms of features, really you don’t need.